Just say NO to shopping on Black Friday! Instead, spend the day relaxing (for God’s sake, don’t you deserve a day off every once in a while? ), enjoying time with your friends and family, and/or making your own toys! That’s what Marcus and I did with our 7-year-old nephew Logan. We did not buy a single thing at a single store. 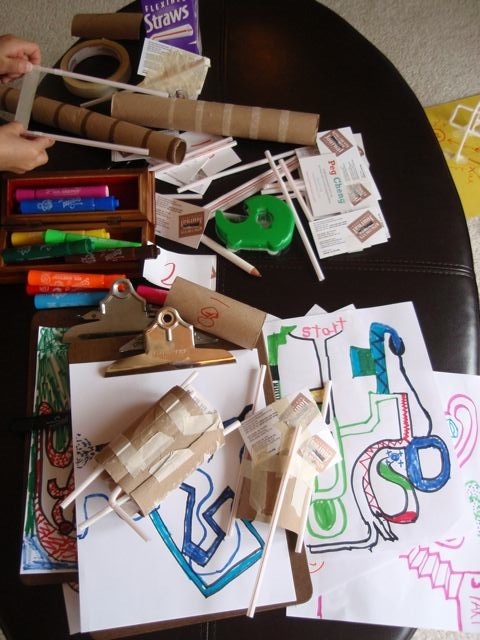 We spent the day after Thanksgiving making toys out of supplies we already had in the house: toilet paper rolls, old business cards, paper, tape, markers, crayons and straws. Here is a game that Logan came up with on his own. It is an obstacle course made out of construction paper, straws, tape and markers. 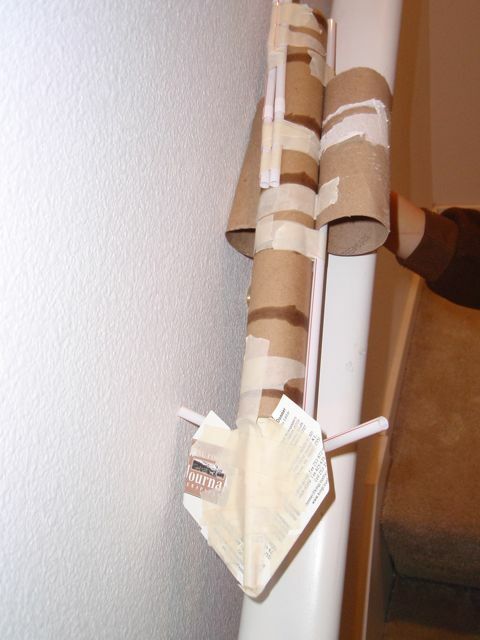 The wheel is made out of the sawed off end of a paper towel roll. According to Logan, you start at either “X” on the right side and you flick the wheel with your finger. The goal is to have the wheel roll through without touching the straws and have it land on the star on the far left end. It’s harder than it looks, but with practice, you can do it! Marcus and Logan came up with these two sleds to slide down our stairway bannister. The one on top is what they came up with yesterday. 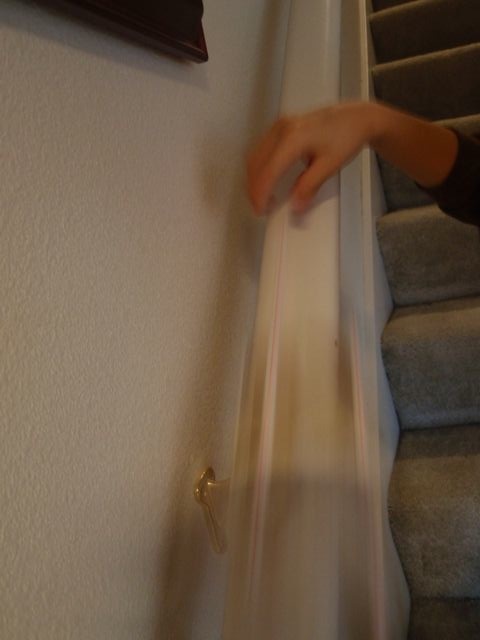 It slid down the full length of the bannister only three times out of many tries. Turned out it was too heavy. We recommended that Logan sleep on it. He did and this morning, he woke up and came up with another idea. The model on the bottom is the new aerodynamic design. As you can see, it really goes! These are just a few of the things you can come up with using your imagination and some everyday supplies. 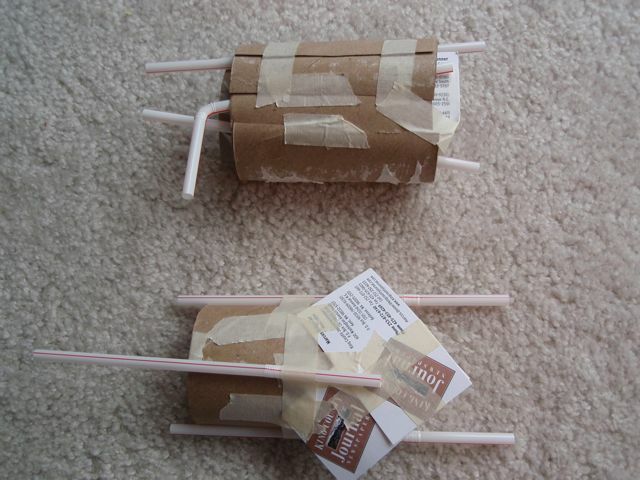 Think you can’t come up with any homemade toys on your own? Just ask your favorite 7-year-old to help you out! It’s so much more fun and way more frugal than shopping amongst the hordes on Black Friday. 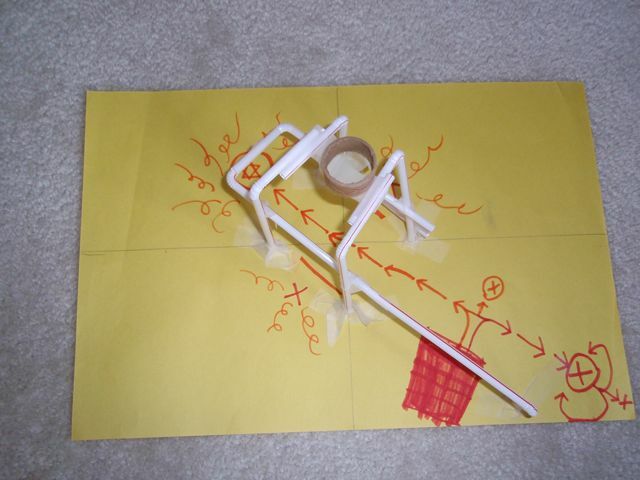 When we made our obstacle croquet course, the 7 and 9 year old boys next door turned out to be pretty good engineers! And as you mentioned, it gives them an experience as well.